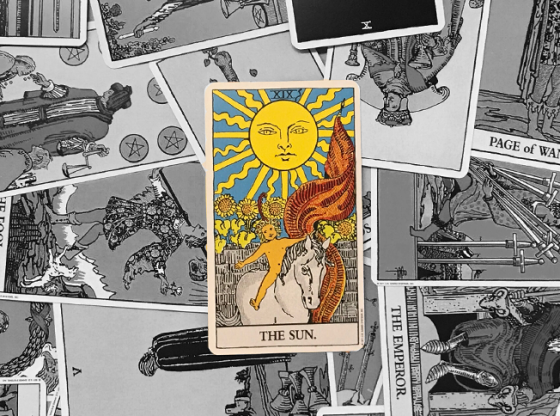 The Tarot’s four suits cover human experience pretty well. 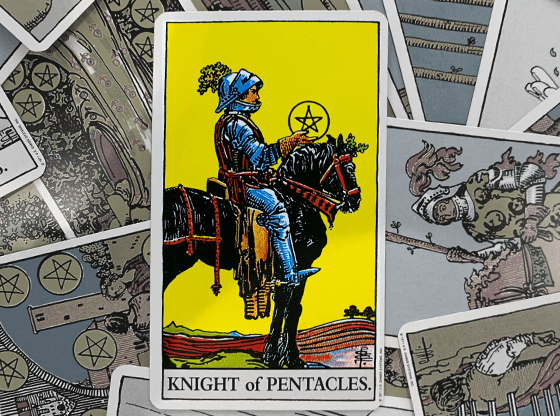 Beyond the cerebral communication of Swords, there is the material plane covered by Pentacles, our emotional experiences covered by the suit of Cups, and our creative nature, which is expressed in the Tarot by Walking Sticks or Wands. All of our thoughts, ideas and conversations exist in a sphere of reality that is neither tangible nor emotional. 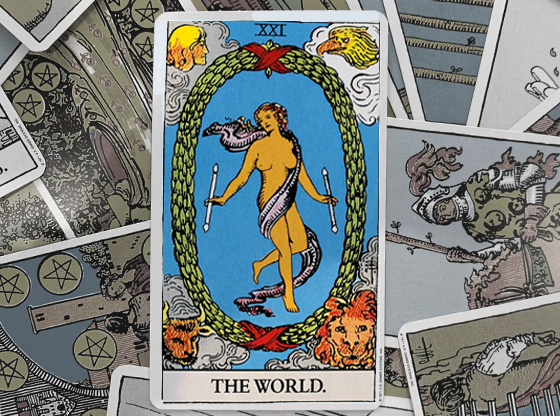 The Tarot deck expresses this phenomenon as a Sword. Your thoughts are truly the only thing you have to yourself. Information is different than other things you give away. When you share information, another person has it, but you still have it too. Information catalogued in our brain feeds cerebral thought. This exists without having an emotional side, although our thoughts are often inseparable from feelings. Our ideas often lead to creative expression or manifest as plans to make money or advance our social interactions. 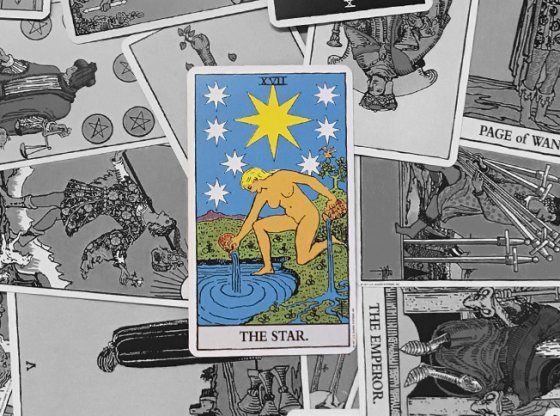 The beauty of the Tarot deck is its coverage of all the states of human experience in less than eighty cards. They describe the past, explore the state you are in and predict the future. 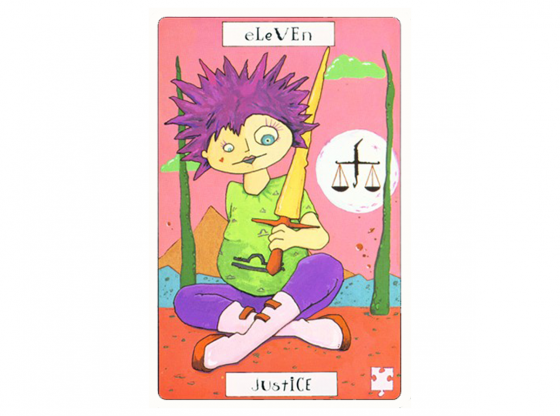 There are fourteen cards in the suit of Swords in the deck. Each of them covers one of the phases of thinking and communication. In the first phase, a “thought” is your mind producing communication. Communication starts the second phase with a discussion of a thought, be it in person, on the phone, online or in some other form. The third phase in this is in experiencing the expression of the idea, be it listening to a friend, or reading words in a centuries old book or seeing a message in a painting on a museum wall. When a Sword card appears in your reading, thoughts and communication dominate. Your reading is divided into looking at your past, present and future. A Sword card in the past position can recall a good idea you had. If you thought about moving to a pleasant part of the world and everything you have now is because of this idea, you might see an upbeat, visionary Sword card in the past position. If you are currently talking about where you want to go in life, a Sword card in the present position will not only reflect this, it might reveal the psychology behind your plans. 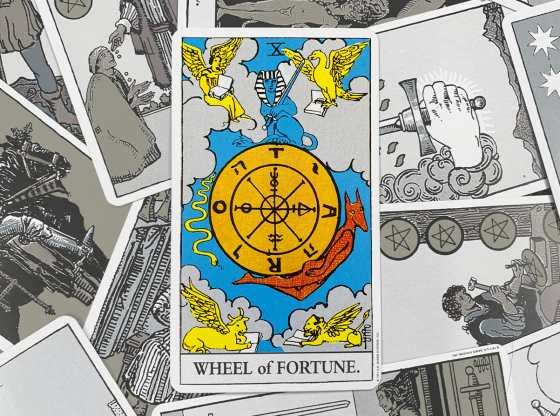 One great thing about the Tarot is the clues it offers you about your deepest motivations. In the future position, a Sword card can be interpreted as you getting your say so in a dispute or having an idea of how to solve your current problems. When many cards from the suit of Swords appear in your reading, your situation is not dominated by action or results, but by analysis. The phrase “paralysis by analysis” might apply if you find that all you do is talk about and describe things in your world instead of seizing opportunities or embracing passions. 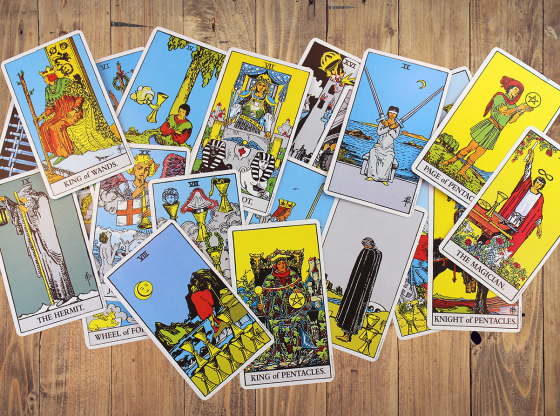 A Tarot reading without any Swords might indicate wallowing in emotion and process without any plan or audience for your efforts. When your Tarot reading has cards with Swords and cards with Pentacles, pay attention to discussions about money and possessions. 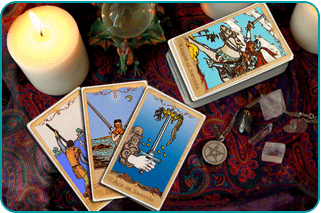 When the suit of Wands accompanies Swords, your ideas are able to find a productive outlet. With Cups, Swords can produce poetic words of love as easily as raging rants that might appear in the heat of the moment. Each card from the suit of Swords carries detailed meanings, and the complex composition of each one changes as other cards join the reading. Isolated, though, there is a specific relationship each of these cards has to the human condition’s natural use of thinking and communicating. 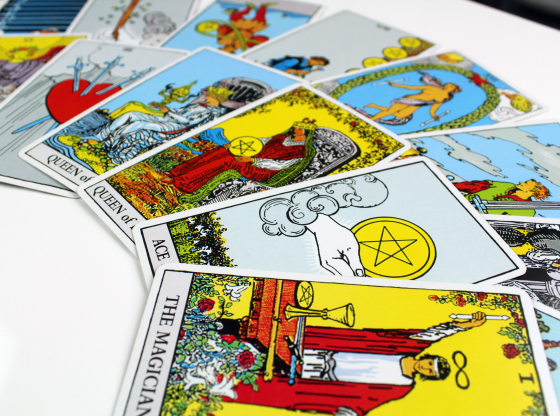 Read below to see what each card covers in the area of cerebral manifestations. The Ace of Swords might be better illustrated with the conventional cartoon of a light bulb over one’s head. Clear thought and precise comprehension are indicated here. Logic at its sharpest is this card. The Two of Swords is the card that appears when you know the truth, but are in denial about it. The crossed swords in this illustration represent cross-purposes and the blindfold represents avoidance. The Three of Swords might appear to be about a heartbreak and emotion. It is actually an indicator of understanding that something is lost forever. Be it a breakup or a death, comprehending loss is part of any process. The Four of Swords appears to be a bit stiff, but the lively process of contemplation is as active on the inside as it appears peaceful on the outside. Many people think about what they should get before considering anyone else. 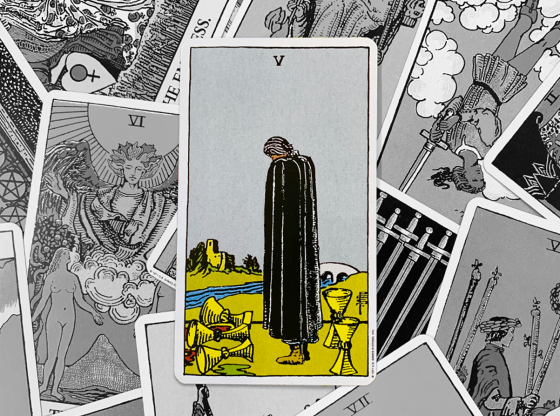 If the Five of Swords appears in your reading, this thought process might be afflicting you. Not thinking you are selfish is a hallmark of selfish people. After the state of mourning there is the mental process of getting back on with things. The Six of Swords illustrates how rumination can occur while you are trying to move on. No matter how sad your story, standing still for too long is never a good narrative. If you have a good reason to take the easy way out, the Seven of Swords will only reinforce your mental gymnastics. This is the card of rationalizations. We all do this; it is fundamentally human to rationalize our actions. Limiting them in our lives and their impact among others is what is important. The Eight of Swords reminds us that being stubborn has its rewards, especially if you like being bound close to the world you have chose. It is great if you like being blind to possibilities that life has to offer outside of the sphere of your limited experiences. The Nine of Swords illustrates the night terrors of those who feel guilty, and who see the situation as hopeless. When there is no turning back from the wrong direction, the Nine of Swords marks this realization. As grimly illustrated in the Ten of Swords, many martyrs have paid the ultimate price. Most, however, just complain about their situation as the convenience of blaming others assists in deflecting attention away. 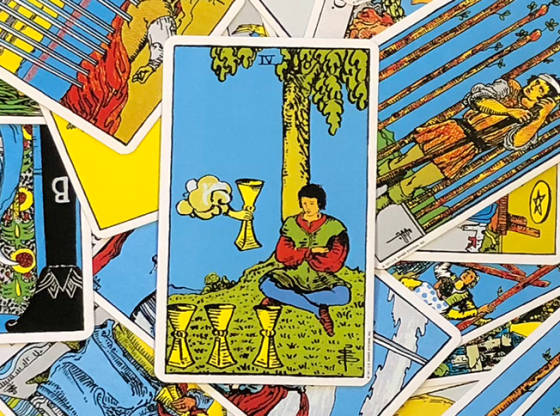 When your thinking is immature, or when your communication is vulgar, unclear and self-absorbed, the Page of Swords appears to point out how much growth must be ahead. The Knight of Swords indicates some rapidly developing idea, or communication with a transformative lesson. Your polite conversation is something everyone has come to rely on as a stabilizing force. The Queen of Swords points out you might even be nice as a way to stay in control. You are so right. The King of Swords indicates your ideas are shown to be in accordance with the way the world works. Someone else might even acknowledge this. In conclusion, the presence of Swords might mean the absence of passion and pleasure in your life as you have much thinking, sorting and communication to take care of. But the process of analysis can be as fun and rewarding as any other part of life, so enjoy holding your sword high.